1 of 5 Place dry noodles in a large bowl and add the hottest tap water you can. Soak 20 minutes. 2 of 5 Meanwhile, heat broiler. Toss zucchini with oil and 1/8 tsp each of the salt and pepper. Spread onto 1 large or 2 small baking sheets. Broil 5 minutes; flip slices over and broil an additional 5 minutes. Set aside. Lower oven temp to 375 degrees . 3 of 5 In a medium bowl, beat cottage cheese, egg yolks, basil and remaining 1/8 tsp each salt and pepper. 4 of 5 Coat a 13 x 9 x 2-inch baking dish with nonstick cooking spray. Spread 1/2 cup of the marinara on bottom of dish. Top with 3 of the soaked noodles. Top noodles with 2 cups of the cottage cheese mixture. Add 3 more noodles to dish. Top noodles with half the zucchini slices. Combine remaining marinara sauce, the diced tomatoes and chopped artichoke hearts. Spread half over zucchini. Top with 3 noodles. Layer with remaining 2 cups cottage cheese mixture, remaining zucchini slices and 1 cup of the mozzarella. Add remaining 3 noodles, remaining marinara mixture and top with remaining 2 cups mozzarella. 5 of 5 Cover with nonstick foil and bake at 375 degrees for 35 minutes. Uncover dish and bake an additional 30 minutes, until cheese is melted, edges are bubbly and noodles are tender when pierced with a knife. 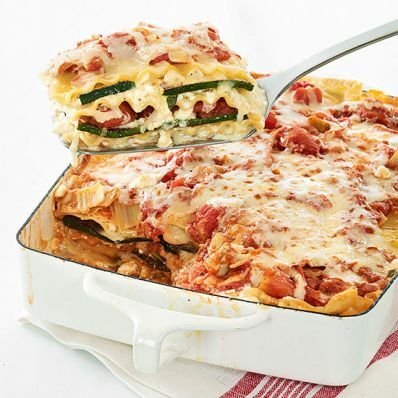 Sprinkle lasagna with chopped parsley, if using, and let stand 20 minutes before slicing. Per Serving: 5 g fiber, 26 g pro., 965 mg sodium, 13 g Fat, total, 74 mg chol., 6 g sat. fat, 42 g carb., 390 kcal cal.